Plenary Lectures Process Systems Engineering and CAPE – What Next?(R. Gani, I.E. Grossmann). Reactive and Hybrid Separations of Chemicals and Bioactive Substances: Modeling and Optimization, (A. Górak). Crystal Engineering for Product and Process Design(M.F. Doherty). Among the Trends for a Modern Chemical Engineering: CAPE an Efficient Tool for Process Intensification and Product Design and Engineering (J.-C. Charpentier). Perspectives for Process Systems Engineering - a Personal View from Academia and Industry (K.-Ulrich Klatt, W. Marquardt). Theme 1. Modelling in CAPE - New Horizons Keynote Lectures State-of-the Art in Short-Term, Medium-Term, and Reactive Scheduling for Large-Scale Batch and Continuous Processes (C. Floudas). Perspectives on Process Systems Engineering R&D in Support of Pharmaceutical Product/Process Development and Manufacturing (G.V. Rex Reklaitis). Theme 2. Products and Processes Design Fundamentals Keynote Lectures Renewable Raw Materials: Chance and Challenge for Computer-Aided Process Engineering (A.C. Dimian). Management of Innovation and Process System Engineering (J.-M. LeLann, S. Negny). Theme 3. Optimisation and Optimal Process Control and Operation Keynote Lectures Parametric Programming & Control: From Theory to Practice (E.N. Pistikopoulos et al.). Large-scale Nonlinear Programming: An Integrating Framework for Enterprise-Wide Dynamic Optimization (L.T. Biegler). Theme 4. Systems Biology and Biological Processes Keynote Lectures Analysis and Design of Metabolic Networks - Experiments and Computer Simulation (E. Heinzle et al.). Live & let die - A Systems Biology View on Cell Death (T. Eißing et al.). Theme 5. Process Integration and Sustainable Development Keynote Lectures Integration of Process Site Utility Systems(R. Smith). The Ecological Impact of the Sugar Sector- Aspects of the Change of a Key Industrial Sector in Europe (G. Gwehenberger, M. Narodoslawsky). 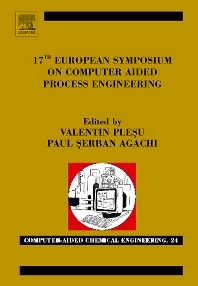 The 17th European Symposium on Computed Aided Process Engineering contains papers presented at the 17th European Symposium of Computer Aided Process Engineering (ESCAPE 17) held in Bucharest, Romania, from 27-30 May 2007. The ESCAPE series serves as a forum for scientists and engineers from academia and industry to discuss progress achieved in the area of Computer Aided Process Engineering (CAPE). The main goal was to emphasize the continuity in research of innovative concepts and systematic design methods as well the diversity of applications emerged from the demands of sustainable development. ESCAPE 17 highlights the progresss software technology needed for implementing simulation based tools. The symposium is based on 5 themes and 27 topics, following the main trends in CAPE area: Modelling, Process and Products Design, Optimisation and Optimal Control and Operation, System Biology and Biological Processes, Process Integration and Sustainable Development. Participants from 50 countries attended and invited speakers presented 5 plenary lectures tackling broad subjects and 10 keynote lectures. Satellite events added a plus to the scientific dimension to this symposium.